As we continue to break new ground in the field of cosmology, the importance of carefully categorizing the objects we see comes into focus. Part of this stems from the fact that, increasingly, we find that many objects appear to be the same on a macroscopic level, but are vastly different internally. In other instances, one phenomenon can manifest in numerous strange ways. Our system is far from perfect, as you will soon learn, but to start.. the common thread in this series is the word “nebula,” which—at its most rudimentary point—refers to a large cloud of gas and/or dust—though all are not created equal. In fact, no two are ever exactly alike. Dark nebulae are like reflection nebulae in that both are largely composed of interstellar dust. While the latter nebulae openly exhibit star-formation activity, the former are more secretive about it—optically, they look like big holes in space (other wavelengths are a whole other thing). Anyway, the basic gist is: dust particles in dark nebulae are so densely-packed, almost all light is blocked from anything inside of, or behind, the nebulae. To reiterate, these dust-filled nooks and crannies don’t snuff out star-formation activity… they merely prevent light from escaping. Moreover, reflection, emission and dark nebulae tend to go hand-in-hand. The best match-ups generally come in the form of objects called Bok Globules. Examples include the Pillars of Creation, Fairy of the Eagle and the Cone Nebula. 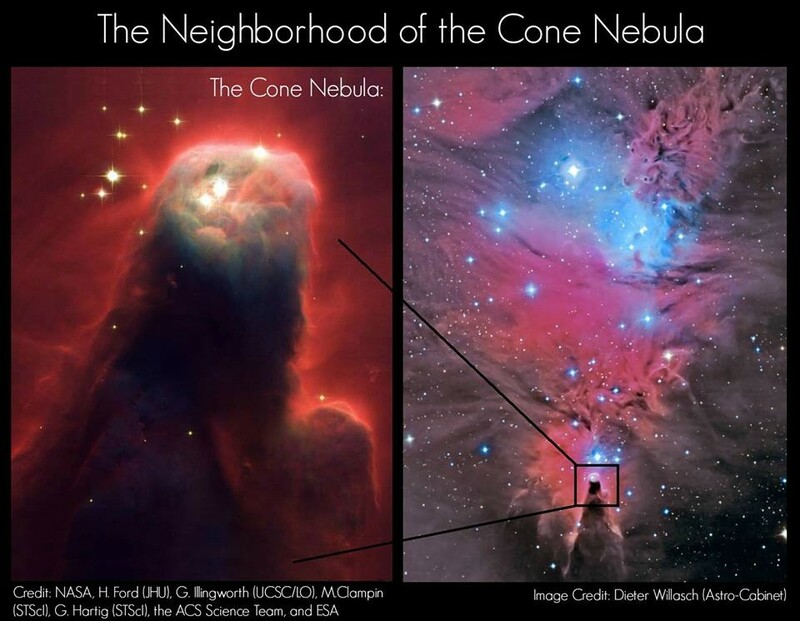 As you can see, the Cone Nebula is multi-layered. The pillar itself is largely opaque to the eye, but near the top, baby stars have ionized a portion of the gas and dust—triggering an emission nebula. Ultimately, enough material was degraded for light to finally emerge, but in spots where the dust hasn’t completely let up, starlight echos through the pillar as it bounces from particles of dust—generating small and large reflection nebulae. Often, stars born inside these dust-filled cocoons, which tend to be isolated, are extremely large,. Yet the globules themselves typically contain around 100 solar masses of material (enough gas and dust to create 100 Sun-mass stars).